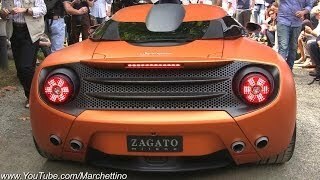 Car lovers who hold their knowledge embraced by time are very well aware about the bond Lamborghini and Zagato share. The very first out from this was a Lamborghini 500 GTZ and after a healthy 50 year relation, they are with us presenting the all new Lamborghini 5-95 Zagato 2014, which is based on the already mind boggling Gallardo LP570-4. 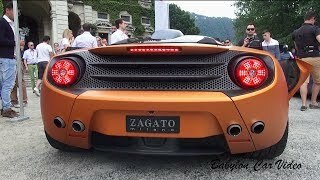 Let us have a look at the review of Lamborghini 5-95 Zagato 2014 to know more about this impeccable synchronization. The Lamborghini 5-95 Zagato 2014 brings for you commendable design philosophy from the house of Zagato. Starting with the front end, you have lot of space for fresh air and some appreciable aerodynamic upgrades. The queue brings a round front fender housed without the air intakes which previously we noticed in its sibling. By absence we don’t really mean they are eliminated but now they come with unique configuration that makes the Lamborghini 5-95 Zagato 2014 distinct. Similarly the headlights too received round of revision and get a look that makes the model more attractive and aggressive. Also new for the model is a front floating spoiler which finds its roots in the Raptor that we saw in 2009. Getting the set of revision side intakes get a smaller size in comparison to the base model and the Lamborghini 5-95 Zagato 2014 now gets a, air scoop on the roof passing some fresh air to the engine. Moving towards the rear end the only pair making difference from a Gallardo is one of taillights. Designed in round shape these new lighting units make this model stand apart in its segment and even from those of what we’ve seen in models coming from Lamborghini. This is where you won’t find any change in Lamborghini 5-95 Zagato 2014. The specifications of Lamborghini 5-95 Zagato 2014 count the figures to what we usually find in any Lamborghini. Beneath its hood it brings a 5.2 Liter V10 engine generating robust output of 570 hp and peak torque of 540 nm. Looking at its power configuration we expect the top speed of Lamborghini 5-95 Zagato 2014 to reach the mark of 200 mph while we presume it to knock the 0-60 mph in just 3.5 seconds.